We've all seen someone on their stag do forced to dress up as Little Bo-Peep or in a big baby's nappy, then paraded around in public in their embarrassing attire. 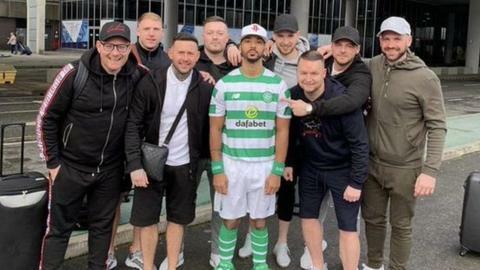 Aberdeen defender Shay Logan's friends were equally unforgiving, but a little bit more inventive - they made him dress up as Celtic captain Scott Brown. The Pittodrie full-back wore a full Celtic strip, complete with Brown's name and number on the back of his shirt. Logan, 31, did not appear exactly thrilled by the idea - given he has had a number of run-ins with Brown and fans of the Parkhead club - saying "the boys have killed me" and "stag do or not, I'm still a Don". The bad-feeling started in 2014 when Logan accused the then on-loan Aston Villa midfielder Alexander Tonev of racially abusing him during a Celtic v Aberdeen game in Glasgow. Tonev denied the accusation, but Logan was found by a Scottish FA tribunal to be a more reliable and convincing witness than the Bulgarian, who was subsequently banned for seven games. English defender Logan reacted on Twitter by saying: "Do the crime, serve the time. Off ya pop geezer. #KickRacismOutOfFootball. Logan revelled in Celtic taking a footballing lesson from Bayern Munich in the Champions League, posting a series of tweets on the night the German giants beat them 3-0 at the Allianz Arena. Aberdeen striker Sam Cosgrove was sent off minutes into a home defeat by Celtic for a crunching tackle on Brown. In the aftermath, Logan appeared to kick a ball at the former Scotland captain, which prompted Brown to take a pop at him in his post-match interview on Celtic TV. "Wee Logan did a runner right after it as he usually does," he said. Aberdeen beat Celtic 1-0 on the final day of the 2017/18 season to seal a fourth consecutive second-place finish in the Scottish Premiership. It was the first and only time Brendan Rodgers suffered a domestic home loss as the Glasgow club's manager. Logan was understandably delighted, and celebrated by holding his hands up to his ear and taunting the home support, which caused anger from Mikel Lustig and Dedryk Boyata in particular. Leigh Griffiths also threw a ball at him before the defender was shown a red card, and fined by manager Derek McInnes. When Celtic were knocked out of the Champions League at the beginning of this season at the qualifying stage, it appeared Logan was not giving them much sympathy, tweeting a laughing emoji after AEK Athens beat them 2-1 to win 3-2 on aggregate.